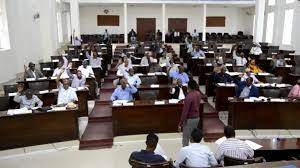 HARGEISA–The new regional allocation of seats in parliament was added in the electoral law which was tabled in Somaliland parliament. The new law which the Horn Newspaper reporter received a copy; confirms that article 78 of the law shows the quotas of seats allocated for every region of Somaliland. The total number of parliamentary seats in all regions of Somaliland is 82. According to the new electoral law it has been decided that the country will use the 2005 electoral bill to run the elections. Articles 77 of the new electoral law states that the electoral boundaries of the 1960 independence era will be used demarcate constituency borders. In another development the new electoral law will follow the 26th June 1960 regional borders of the six Somaliland provinces this is written on article 1 of law 109 of the electoral law of Somaliland. Members of parliament representing Awdal province vehemently opposed the new electoral law tabled in the lower House of Representatives which was passed by the cabinet and prepared by the Somaliland Electoral Commission (SLEC). The new electoral did not increase the general number of parliamentary seats in parliament. This is the work for the legislators in the House of Representatives to decide. The opposition National Party (Wadani) has distanced itself from the new electoral law claiming it has nothing to do with it or its deliberations.